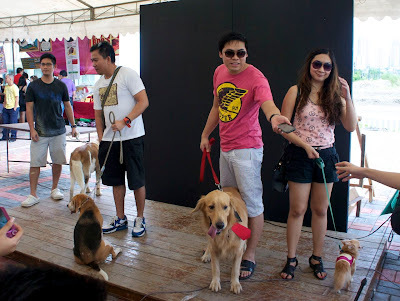 Daddy and I went back to the Doggie Love event of Mercato Centrale last weekend. Char Siew had to stay at home since in our previous visit, Daddy realized it's hard to take care of two dogs and eat at the same time. 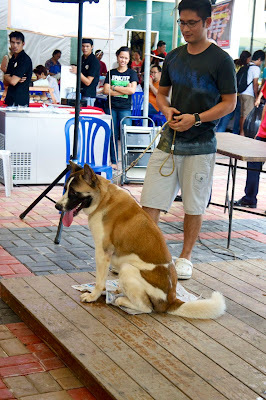 For this event - they invited the Sibe Tribe - which is a group of people and Siberian Huskies. I am not a Siberian Husky - but I do have friends who are Siberian Huskies. They had contests for dogs - and in one of them Daddy volunteered to be one of the participants. The contest we joined was called - Newspaper Sit. 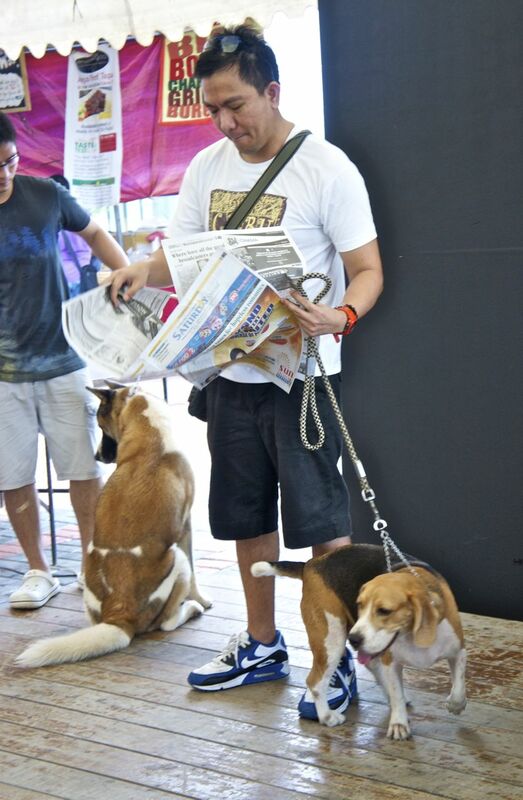 The rule of the game is to basically make us dogs sit on a newspaper when the music stops. The last dog caught not sitting on the newspaper is eliminated. There were four contestants. And as you can see - none of us are Huskies. That's Daddy trying to concentrate on preparing the newspaper. Note - I love eating newspapers - so I wasn't sure how this will go. What will happen first? Will I sit on the newspaper? Or will I chew on the newspaper. Saying hi to my co-competitor. 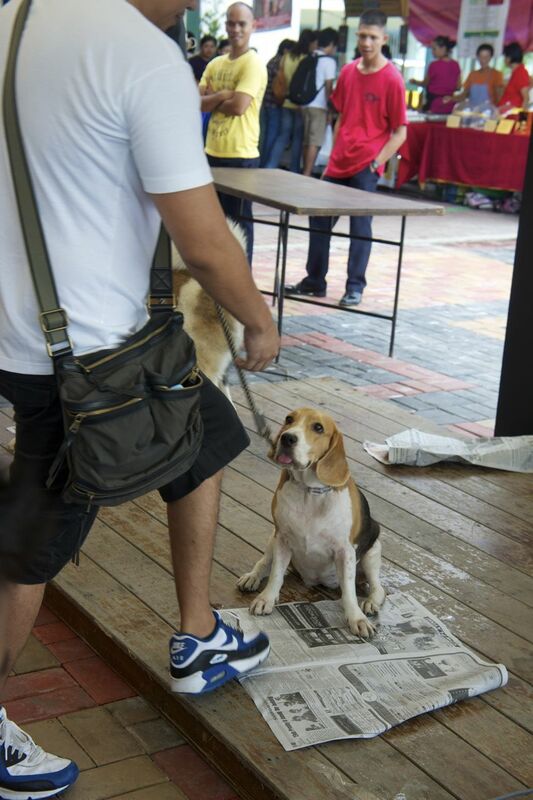 As you know - I'm one friendly Beagle. This handsome dude is one of the contestants. I'm not sure what his breed is. Can someone help with that? Round one. That's simple. Daddy says sit. and I sit. I got a lot of treats from Daddy in this contest. Hurray! See how good I am with this game? This cutie won the contest. He sat later than I did - but his behind was right on target. 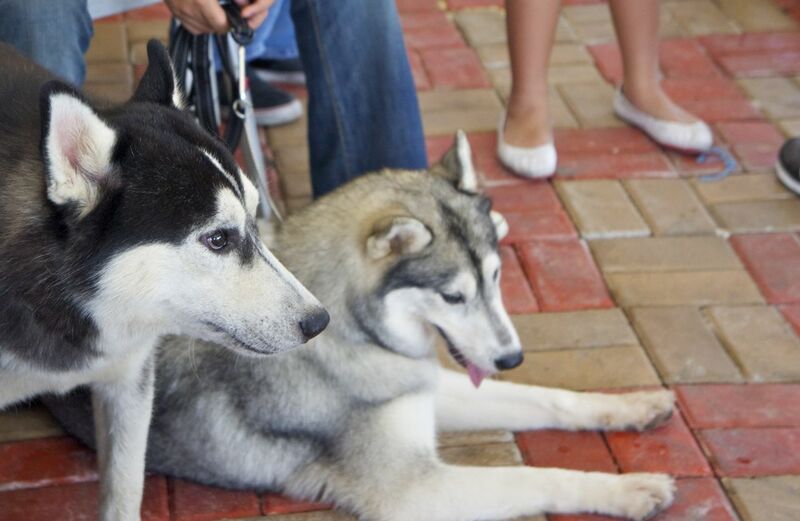 The Siberian Huskies seem to agree - that even if I lost the contest --- I deserve a treat. So the contest organizers gave all of us contestants yummy Liver Treats. Hello Hero. It is fun. 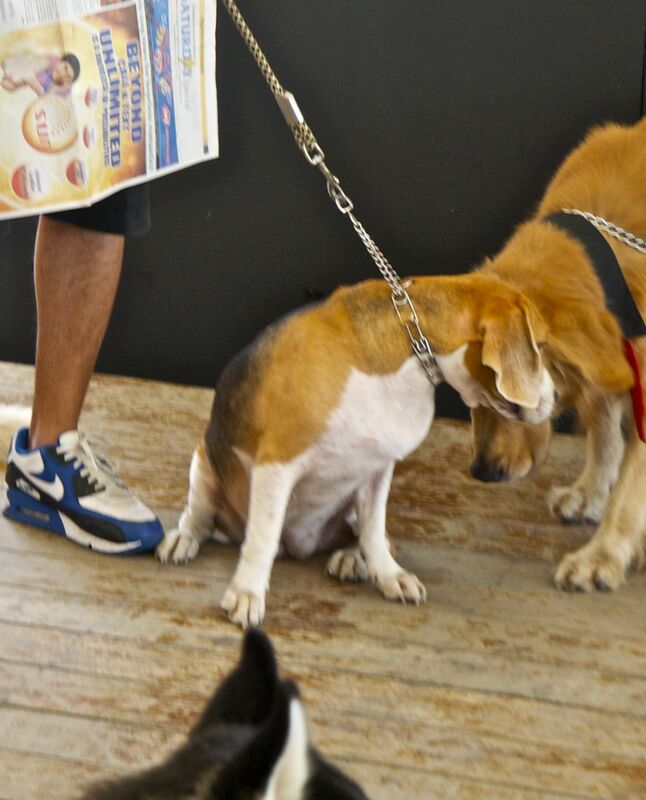 When humans ask us to do tricks, they give us treats. Char Siew got some of the liver treats when we got home, but he was really cross that he got left behind. @Anon ... You should thank Uncle Ryan for taking pictures of the cute doggie and his human. I think you did a great job Midori! I don't know if I would have sat on newspaper... I prefer soft carpet. I don't like sitting on slick surfaces. During our training class at PetSmart, if mom forgot to bring an old towel for me, the dog trainer had to grab a bed (for purchase) into the training area for me to sit on and to do obedience training. Spoiled? Who me? The winning contestant looks like a husky/german shep mix to us! But we're not experts. oh, would you be so kind to tell me who's uncle ryan, midori? i just came across your daddy's blog today. anyway, tell uncle ryan i said thanks. 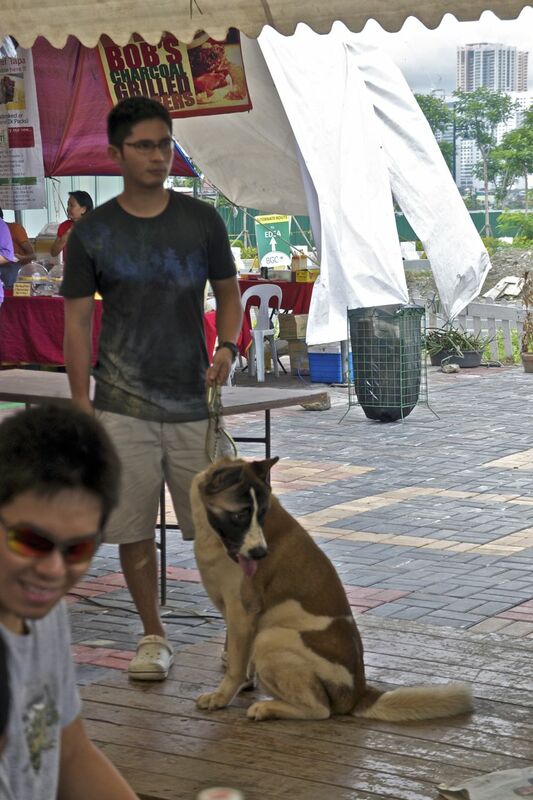 would have been nice if he took a close up shot of the cute dog's human, hihihih! @Anon - you can see his picture in this post. I have to hide his face because he doesn't like being called the Echoserang Frog. @Ipe - You make me BOL ( Bark Out Loud ). Thanks for dropping by. 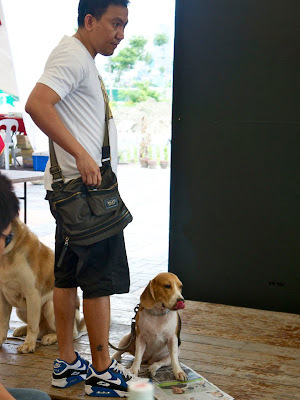 To both - Finally a post that seems to have merged the interest of the dog lovers and the gay readers of this blog. @Laney - Your story on requiring a towel for sit-training is so funny. I wonder how you got "trained" to look for such luxury. Char Siew is your opposite - he actually doesn't like lying down on cloth. He prefers the floor. I don't mind the floor but I do like sleeping on a bed or even a rug. "you can see his picture in this post. I have to hide his face because he doesn't like being called the Echoserang Frog.